Get your tickets from www.urbtix.hk! The brilliant playwright behind Shakespeare in Love and Rosencrantz and Guildenstern Are Dead turns the classic “whodunit” genre on its head, as this play within a play combines murder mystery with funny parody and satirical meta-theatricality to create an hour of uninterrupted laughter! In this reimagined version of Sir Tom Stoppard’s classic, pompous drama critics Birdboot and Moon attend the production of a new theatrical thriller. The classic ingredients are there: an isolated country mansion, a dark and stormy night, guests with hidden agendas, a faithful housekeeper, and a mysterious stranger. What will they do with a stubborn corpse that refuses to be found, an overabundance of romantic tension, dangerous games of mahjong, and the immediate threat of murder? First performed in 1968, The Real Inspector Hound is a comic parody of Agatha Christie’s The Mousetrap (which received its first public performance in Hong Kong as recently as 2012). But The Real Inspector Hound is no simple comedy: by blurring the distinctions between fiction and reality, it will leave audiences surprised, enlightened and wondering if they are themselves part of the play. 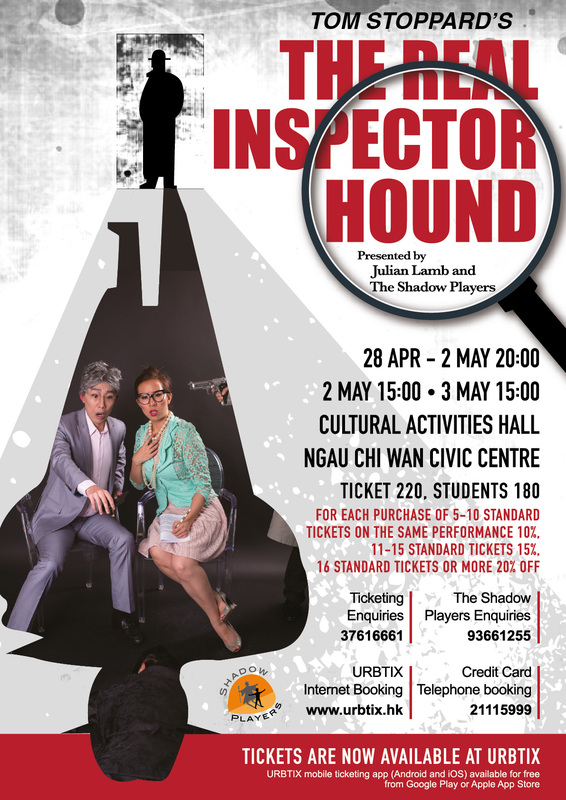 The Real Inspector Hound will be performed nightly at Ngau Chi Wan Civic Centre between 28 April and 3 May 2015 at 20:00, with matinees at 15:00 on 2 and 3 May (Saturday and Sunday).